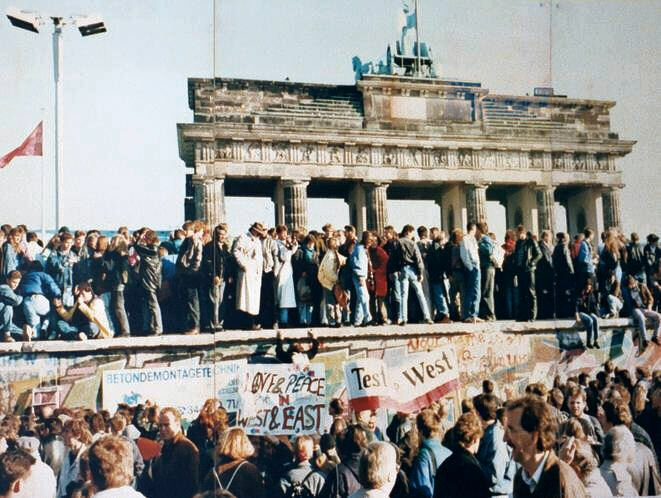 The breaching of the Berlin Wall on the 9 November 1989 was a remarkable day in modern German history. There was much to celebrate then and now, 25 years later, culminating in symbolic anniversary celebrations. Many will be familiar with the object of hate and totalitarianism, which divided the city of Berlin into two, beginning on the 13 August 1961. The Anti-Fascist Protection Rampart (as it was officially referred to by the German Democratic Republic Government), was constructed by the East Germans and completely surrounded West Berlin, an enclave of West Germany, and enclosed it within East Germany. 25 years ago, during my Rotary Youth Exchange Eurotour of Europe, I had the opportunity to travel across East Germany and visit West Berlin. As one can imagine, the Berlin Wall was a major tourist attraction for visitors to West Berlin. For me, the Wall symbolised the paranoia that existed across all Communist societies around the world. Nowhere else was it better encapsulated than by the construction of the Berlin Wall. It demonstrated the absolute lack of freedom and democracy that existed across Eastern Europe. During 1989, my Rotary Youth Exchange year operated within a bubble, so to speak. Much was occurring around the world; from the Tiananmen Square protests in Beijing, China, and the subsequent massacre; to the revolutions that were occurring across Eastern Europe. My experience of these events is somewhat fuzzy, due to my being somewhat wrapped up within my exchange year, as well as the limited methods of disseminating information and news events, particularly due in part to translating information from my newly adopted language to English. As I walked the section of the Wall that I visited in June 1989 there was absolutely no indication that just a few short months later the Wall would be breached, and the death strip separating West Berlin from East Germany would be no more. Postscript: This year during her Rotary Youth Exchange, my daughter Madeleine had the opportunity to experience Berlin with her host school and view the remnants of the Berlin Wall for herself, 25 years later. Ah, the ninth of November, 1989 – my eighteenth birthday. I will certainly never forget that occasion! Perhaps one of the most significant events of our lifetimes so far. The fall of the Berlin Wall. I too remember it only vaguely, more the feeling than the actual event, the surreal feeling that something that we all assumed was unchangeable suddenly seemed to tumble overnight. I guess it is like that in life, things can change so suddenly and our lives are never the same. I remember it happening & not really being sure what was going on because of my limited understanding of Finnish. It was kind of surreal to think that something we had seen up close was being pulled down. When I went to the UK this year I visited the Royal Engineers Museum in Kent & was interested to see a piece of the wall on display in there that the RE Berlin Field Squadron had helped to dismantle. It was quite strange to see it 25 years after – knowing that last time I’d seen it (not that particular piece though), it had been in place in Germany. Your comment expresses similar feelings that I experienced during the period in 1989 (as my post indicated) Barb. The German Club in Canberra secured a panel of the Berlin Wall in 1992. It was sourced from Potsdamer Platz nearby the Brandenburg Gate. Perhaps we walked by the panel in 1989. I only viewed the panel for the first time during our German exchange student’s stay with our family in 2012.